Implants are relatively easy to place where there is adequate bone and they enjoy a high percentage of success. They don’t decay and they are usually simple to restore because all of the components are precision machined to fit into the implant. Most general practitioners have become adept at restoring implants, but many do not have good crown and bridge skills.. Because they have become more comfortable with restoring implants than with restoring natural teeth, their prescription of first choice is implants. This predisposition has led to widespread acceptance of a “piecemeal” approach to dentistry that focuses on filling holes and spaces–restoring one tooth at a time. As a tooth is lost, it is replaced with an implant. 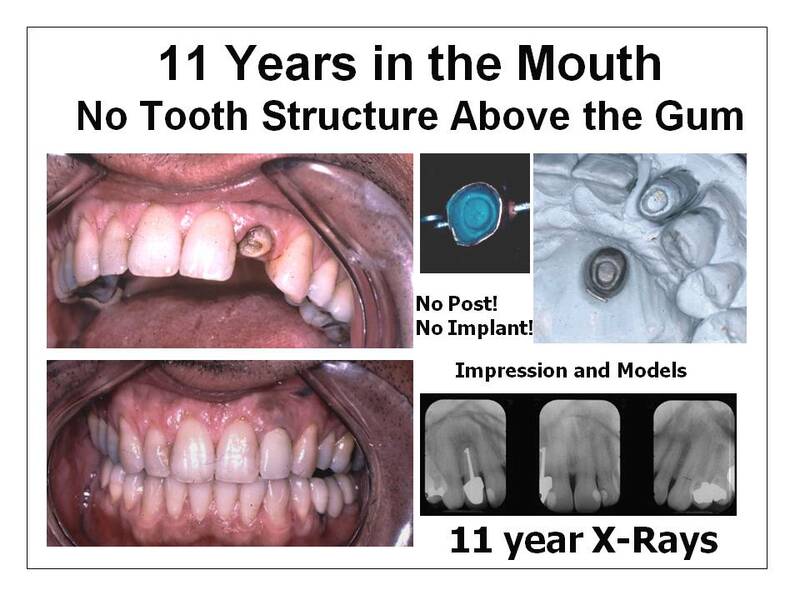 However, it cannot be assumed that a patient will always be a candidate for implant placement. Factors that can interfere with the placement of implants include changes in health, anatomy, desires and finances. A patient who has had implants placed in this manner may face a restorative dilemma when teeth fail around implants and additional implants cannot be placed. There is a precision technique with copper bands that has been used for crown and bridgework for over seventy years. This technique is not taught in dental schools because there is a perception that the techniques are too difficult for students to master. Ask any patient who has crowns and bridges in their mouths for over a decade, and the odds are very good that the copper band techniques were used to make them. The individual tooth copper band technique—unlike the multiple tooth rubber impression technique—focuses on registering all of the tooth structure below the gum to retain crowns and bridges. In fact, the technique does not require any tooth structure, posts or build-ups above the gum! (Fig 2) The result is crown and bridgework that fits with perfection and does not fall out—even without cement! Crowns made with this technique are worn—without exception–for a trial period with Vaseline ointment or rubber prior to permanent cementation. They also have margins that are far below the gum and are not visible. Because these crowns are designed on the principle of the Mason Jar cover—the best device every invented for food preservation–decay underneath is a rarity. Many patients do not realize that just because they were told that a tooth has to be extracted does not necessarily mean that their tooth cannot be saved. Patients should be aware that other options for dental restoration may be available to them aside from what they have been offered. 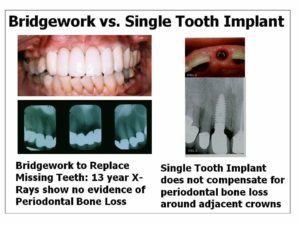 Implants are wonderful restorations in optimal circumstances, but they are not the only solution to restorative problems and they may not even be the best solution. There are situations where implants cannot be placed. 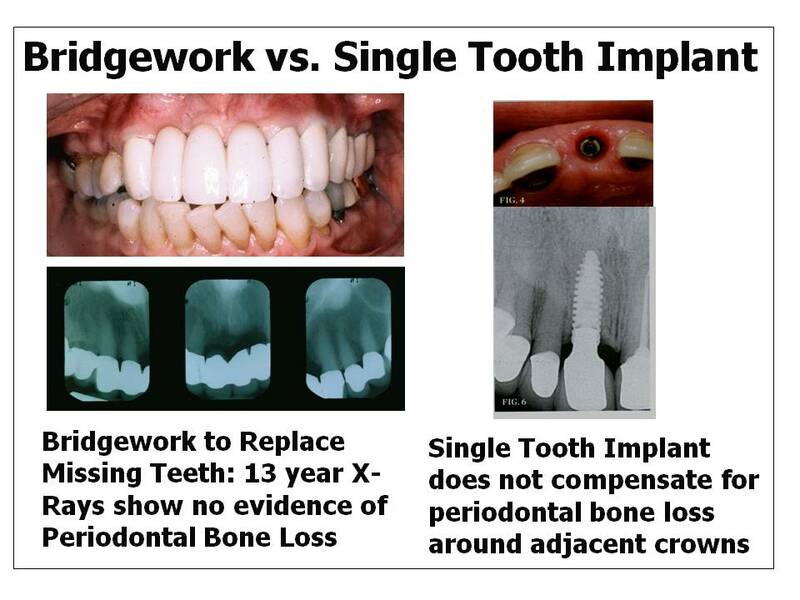 In areas of poor anatomy, implants of adequate length to support dental restorations may not be possible, even with bone grafts. Such implants may initially osseo-integrate (fuse with the bone) but are likely to fail if overloaded with forces. When selecting the best treatment, the best approach follows the rule of Hippocrates “First, do no harm”. Teeth can always be extracted at a later date if necessary. There is never an emergency that requires implants to be placed immediately. Implant placement should be well planned and thought-out. Wouldn’t you rather save your own teeth first?